I'm having a rough time painting these last few days. For every one decent painting I do I also do about 2 or 3 wipers. This happens sometimes, and it is always extremely frustrating. I have to give myself little pep talks throughout the day: "Carol, this is part of the cycle - it's normal - you didn't forget how to paint - take a break - take a walk - don't hit the wall so hard you damage your painting hand" ... things like that. 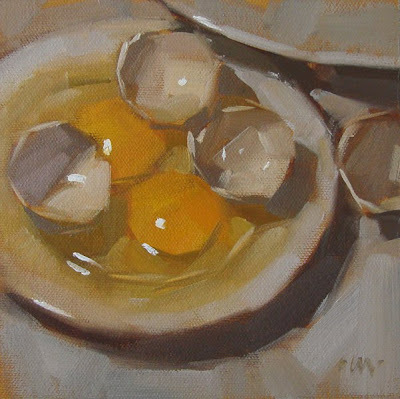 Carol, this one is beautiful, such translucence in the egg white, and the shells look so fragile. I'll bet the wipers weren't so bad either. Having high standards is who you are, don't try to change that! Well, I don't know about the wipers, but that raw egg looks pretty fabulous. Nice job! This is stunning! How you managed to paint egg whites is beyond me. I hope you are happy with this. It is very inspiring! I'm sorry to hear you had a frustating time in your painting lately, but believe it or not it is comforting to hear even an artist as good as you has a difficult time now and then. The eggs are incredible you are awesome. Well, I love this one, Carol, but I want to say THANK YOU for writing that! I've been having a terrible time this past week, wiping and wiping - and it looks like I'm not painting! Which probably makes me more tense when I try again! Keep repeating "Part of the process...."
I've been told that when you go through phases like this it means you are growing and are reaching a new plateau. Ride it out and later look back to see if the quality of your work hasnt improved. Boy do I know the feeling--I will do quite a few paintings that I really feel I'm making progress and then POW--a really bad one where nothing works! Usually it is because my source is bad. My process is to take lots of photos and then work up value sketches but photos have many limitations and sometimes they are just impossible to recreate what you remember with the data the photo provides--wish I had total visual recall but no such luck! can be termed an 'ordinary subject' and make it a masterpiece. You are an inspiration. Don't Stop. Geez..me too...slow painting! Must be these cold January days? ! This one IS lovely, though! Keep the faith! Yes, please don't damage your painting hand! I had a close call recently and it's sobering. Again, great execution and composition! 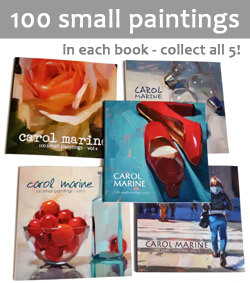 Your paintings and work ethic inspire! Omg..next your husband will be writing us that your arm is in a cast or something!!!! But I know all too well what you are talking about...I think that goes for anything and everything....we have to have peaks and vallies in order to progress...your work is so inspiring and wonderful I don´t EVEN want to see what it looks like when you come out of this spell.....holy marollllly how can it get BETTER....but it will...omg. Would you ever consider posting one you plan to wipe and tell us why you think the painting isn't working? Just a thought! Love your style..
From listening to people who work in media from words to paint to fabric to pixels, it's clear that everyone has times when the work flows forth effortlessly, and times when it doesn't. My mantra is "What I lack in talent, I make up in volume." That said, this looks like a "work flowing" piece to me. I hope you feel better soon, it's probably the start of the new year, it's always a little troublesome, but I'm sure you'll be fine pretty soon! I don't mean to "gain from your pain", but putting this down in writing is so encouraging to me...we always feel like it only happens to us! A friendship is born the moment that one person says to another, "Oh, you too?" Unique, fun, and fabulously glossy eggs! I forgot to say how beautiful this is! !